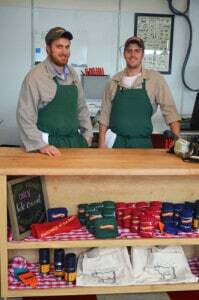 The Vermont Butcher Shop, which specializes in grass-fed beef, heritage pork and humanely raised chicken, has a commissary and retail store in Londonderry and a retail shop in Manchester Center. Like the other retail sites, the Rutland store features a variety of house-made sausages, pasture-raised lamb, humanely raised veal and beef, charcuterie, and seasonal specialties. The store also carries specialty crackers, cheeses, salts and spices, and staff are fully trained to give customers detailed information on how to prepare and cook every product. “We believe that treating animals, the environment and our customers with respect creates a better product and a better experience,” DeLauri said. “Everything we do is focused on providing the best quality possible and real value to Vermonters. That all starts with raising many of the animals ourselves, and working with farmers who share our commitment to the working Vermont landscape, animal health, and quality. Delauri said a focus on fresh water, high-quality feed, and access to the outdoors produces what he calls “honest meat.” “Raising animals this way is the antithesis of factory farming, and produces a happier animal and a much higher-quality product that tastes better and provides a better value,” DeLauri said. Vermont Butcher Shop began considering Rutland after hearing about the effort to recruit Phoenix Books, spearheaded by Green Mountain Power. DeLauri contacted GMP Vice President Steve Costello Well over a year ago. Their discussion led to a broad collaboration involving GMP, city officials, the Rutland Redevelopment Authority, Rutland Region Chamber of Commerce, Rutland Economic Development Corp., MKF Properties, Downtown Rutland Partnership, and Castleton University. Several of them offered incentives to the store.